You say, "The LORD's way is not fair!" R. (3) If you, O Lord, mark iniquities, who can stand? R. If you, O Lord, mark iniquities, who can stand? more than sentinels wait for the dawn. You shall not kill; and whoever kills will be liable to judgment. and whoever says, 'You fool,' will be liable to fiery Gehenna. and then come and offer your gift. Settle with your opponent quickly while on the way to court. and you will be thrown into prison. you will not be released until you have paid the last penny." For your reading, reflection, faith-sharing, comments, questions, discussion. of which he is guilty and the sin he has committed, he shall die. cy; you forgive all sin” (John Mandakuni, “Oratio”, 2-3). Of course, God’s forgiveness is closely interwoven with personal conversion. (Council of Trent Session 14, 4). and that the Lord God of hosts may really be with you. and make yourselves a new heart and a new spirit. Please FReepmail me to get on/off the Lenten Ping List. 20. For I say to you, That except your righteousness shall exceed the righteousness of the Scribes and Pharisees, you shall in no case enter into the kingdom of heaven. 22. But I say to you that every one who is angry with his brother shall be liable to judgment; whoever insults his brother shall be liable to the council, and whoever says, 'You fool!' shall be liable to the hell of fire. HILARY; Beautiful entrance He here makes to a teaching beyond the works of the Law, declaring to the Apostles that they should have no admission to the kingdom of heaven without a righteousness beyond that of Pharisees. CHRYS. By righteousness is here meant universal virtue. But observe the superior power of grace, in that he requires of His disciples who were yet uninstructed to be better than those who were masters under the Old Testament. Thus He does not call the Scribes and Pharisees unrighteous, but speaks of their righteousness. And see how even herein he confirms the Old Testament that He compares it with the New, for the greater and the less are always of the same kind. PSEUDO- CHRYS. The righteousness of the Scribes and Pharisees are the commandments of Moses; but the commandments of Christ are the fulfillment of that Law. This then is His meaning; Whosoever in addition to the commandments of the Law shall not fulfill My commandments, shall not enter into to the kingdom of heaven. For those indeed save from the punishment due to transgressions of the Law, but do not bringing into the kingdom; but My commandments both deliver from punishment, and bring into the kingdom. But seeing that to break the least commandments and not to keep them are one and the same, why does He say above of him that breaks the commandments, that he shall be the least in the kingdom of heaven, and here of him who keeps them not, that he shall not enter into the kingdom of heaven? See now to be these least into the kingdom is the same with not entering into the kingdom. For a man to be in the kingdom is not to reign with Christ, but only to be numbered among Christ's people; what he says then of him that breaks the commandments is, that he shall indeed be reckoned among Christians yet the least of them. But he who enters into the kingdom, becomes partaker of His kingdom with Christ. Therefore he who does not enter into the kingdom of heaven, shall not indeed have a part of Christ's glory, yet shall he be in the kingdom of heaven, that is, in the number of those over whom Christ reigns as King of heaven. AUG. Otherwise, unless your righteousness exceed the righteousness of the Scribes and Pharisees, that is, exceed that of those who break what themselves teach, as it is elsewhere said of them, they say, and do not; just as if he had said, Unless your righteousness exceed in this way that you do what you teach, you shall not enter the kingdom of heaven. We must therefore understand something other than usual by the kingdom of heaven here, in which are to be both he who breaks what he teaches, and he who does it, but the one least, the other great; this kingdom of heaven is the present Church. In another sense is the kingdom of heaven spoken of that place where none enters but he who does what he teaches, and this is the Church as it shall be hereafter. ID. This expression, the kingdom of heaven, so often used by our Lord, I know not whether anyone would find in the books of the Old Testament. It belongs properly to the New Testament revelation, kept for His mouth whom the Old Testament figured as a King that should come to reign over His servants. This end, to which its precepts were to be referred, was hidden in the Old Testament, though even that had its saints who looked forward to the revelation that should be made. GLOSS. Or, we may explain by referring to the way in which the Scribes and Pharisees understood the Law, not to the actual contents of the Law. AUG. For almost all the precepts which the Lord gave, saying, But I say to you, are found in those ancient books. But because they knew not of any murder, besides the destruction of the body, the Lord shows them that every evil thought to the hurt of a brother is to be held for a kind of murder. AUG. We do not, because we have heard that, You shall not kill, deem it therefore unlawful to pluck a twig, according to the error of the Manichees, nor consider it to extend to irrational brutes; by the most righteous ordinance of the Creator their life and death is subservient to our needs. There remains, therefore, only man of whom we can understand it, and that not any other man, nor you only; for he who kills himself does nothing else but kill a man. Yet have not they in any way done contrary to this commandment who have waged wars under God's authority, or they who charged with the administration of civil power have by most just and reasonable orders inflicted death upon criminals. Also Abraham was not charged with cruelty, but even received the praise of piety, for that he was willing to obey God in slaying his son. Those are to be excepted from this command whom God commands to be put to death, either by general law given, or by particular admonition at any special time. For he is not the slayer who ministers to the command, like a hilt to one smiting with a sword, nor is Samson otherwise to be acquitted for destroying himself along with his enemies, than because he was so instructed privily of the Holy Spirit, who through him wrought the miracles. CHRYS. This, it was said by then; of old time, shows that it was long ago that they had received this precept. He says this that he might rouse His sluggish hearers to proceed to more sublime precepts, as a teacher might say to an indolent boy, Know you not how long time you have spent already in merely learning to spell? In that, I say to you, mark the authority of the legislator, none of the old Prophets spoke thus; but rather, Thus said the Lord. They as servants repeated the commands of their Lord; He as a Son declared the will of His Father, which was also His own. They preached to their fellow servants; He as master ordained a law for his slaves. AUG. There are two different opinions among philosophers concerning the passions of the mind: the Stoics do not allow that any passion is incident to the wise man; the Peripatetics affirm that they are incident to the wise man but in a moderate degree and subject to reason; as, for example, when mercy is shown in such a manner that justice is preserved. But in the Christian rule we do not inquire whether the mind is first affected with anger or with sorrow, but whence. PSEUDO- CHRYS. He who is angry without cause shall be judged; but he who is angry with cause shall not be judged. For if there were no anger, neither teaching would profit, nor judgments hold, nor crimes be controlled. So that he who on just cause is not angry, is in sin; for an unreasonable patience sows vices, breeds carelessness, and invites the good as well as the bad to do evil. JEROME; Some people add here the words, without cause; but by the true reading the precept is made unconditional, and anger altogether forbidden. For when we are told to pray for them that persecute us, all occasion of anger is taken away. The words without cause then must be erased, for the wrath of man works not the righteousness of God. PSEUDO- CHRYS. Yet that anger which arises from just cause is indeed not anger, but a sentence of judgment. For anger properly means a feeling of passion; but he whose anger arises from just cause does not suffer any passion, and is rightly said to sentence, not to be angry with. AUG. This also we affirm should be taken into consideration, what is being angry with a brother; for he is not angry with a brother who is angry at his offense. He then it is who is angry without cause, who is angry with his brother, and not with the offense. ID. But to be angry with a brother to the end that he may be corrected, there is no man of sound mind who forbids. Such sort of motions as come of love of good and of holy charity, are not to be called vices when they follow right reason. PSEUDO- CHRYS. But I think that Christ does not speak of anger of the flesh, but anger of the heart; for the flesh cannot be so disciplined as not to feel the passion. When then a man is angry but refrains from doing what his anger prompts him, his flesh is angry, but his heart is free from anger. CHRYS. Or, Racha is a word signifying contempt and worthlessness. For where we in speaking to servants or children say, Go thou, or, Tell you him, in Syriac they would say Racha for 'thou.' For the Lord descends to the smallest trifles even of our behavior, and bids us treat one another with mutual respect. JEROME; Or, Racha is a Hebrew word signifying, 'empty,' 'vain'; as we might say in the common phrase of reproach, 'empty-pate.' Observe that he says brother; for who is our brother, but he who has the same Father as ourselves? AUG. In the third case are three things: anger, the voice expressive of anger, and a word of reproach, You fool. Thus here are three different degrees of sin; in the first when one is angry, but keeps the passion in his heart without giving any sign of it. If again he suffers any sound expressive of the passion to escape him, it is more than had he silently suppressed the rising anger; and if he speaks a word which conveys a direct reproach, it is a yet greater sin. PSEUDO- CHRYS. But as none is empty who has the Holy Spirit, so none is a fool who has the knowledge of Christ; and if Racha signifies 'empty,' it is one and the same thing, as far as the meaning of the, word goes, to say Racha, or 'thou fool.' But there is a difference in the meaning of the speaker; for Racha was a word in common use among the Jews, not expressing wrath or hate, but rather in a light careless way expressing confident familiarity, not anger. But you will perhaps say, if Racha is not an expression of wrath, how is it then a sin? Because it is said for contention, not for edification; and if we ought not to speak even good words but for the sake of edification, how much more not such as are in themselves bad? AUG .Here we have three arraignments: the judgment, the council, and hell-fire, being different stages ascending from the lesser to the greater. For in the judgment there is yet opportunity for defense; to the council belongs the respite of the sentence, what time the judges confer among themselves what sentence ought to be inflicted; in the third, hell-fire, condemnation is certain, and the punishment fixed. Hence is seen what a difference is between the righteousness of the Pharisees and Christ; in the first, murder subjects at man to judgment; in the second, anger alone, which is the least of the three degrees of sin. RABAN. The Savior here names the torments of hell, Gehenna, a name thought to be derived from a valley consecrated to idols near Jerusalem, and filled of old with dead bodies, and defiled by Josiah, as we read in the Book of Kings. CHRYS. This is the first mention of hell, though the kingdom of Heaven had been mentioned some time before, which shows that the gifts of the one comes of His love, the condemnation of the other of our sloth. Many thinking this a punishment too severe for a mere word, say that this was said figuratively. But I fear that if we thus cheat ourselves with words here, we shall suffer punishment in deed there. Think not then this too heavy a punishment, when so many sufferings and sins have their beginning in a word; a little word has often begotten a murder, and overturned whole cities. And yet it is not to be thought a little word that denies a brother reason and understanding by which we are men, and differ from the brutes. PSEUDO- CHRYS. In danger of the council; that is (according to the interpretation given by the Apostles in their Constitutions), in danger of being one of that Council which condemned Christ. HILARY; Or, he who reproaches with emptiness one full of the Holy Spirit, will be arraigned in the assembly of the Saints, and by their sentence will be punished for an affront against that Holy Spirit Himself. AUG. Should any ask what greater punishment is reserved for murder, if evil-speaking is visited with hell-fire? This obliges us to understand, that there are degrees in hell. CHRYS. Or, the judgment and the council denote punishment in this word: hell fire future punishment. He denounces punishment against anger, yet does not mention any special punishment , showing therein that it is not possible that a man should be altogether free from the passion. The Council here means the Jewish senate, for He would not seem to be always superseding all their established institutions, and introducing foreign. AUG. In all these three sentences there are some words understood. In the first indeed, as many copies read without cause, there is nothing to be supplied. In the second, He who says to his brother, Racha, we must supply the words, without cause, and again, in He who says, You fool, two things are understood: to his brother, and, without cause. And this forms the defense of the Apostle, when he calls the Galatians fools, though he considers them his brethren; for he did it not without cause. 24. Leave there your gift before the altar, and go your way; first be reconciled to your brother, and then come and offer your gift. AUG. If it be not lawful to be angry with a brother, or to say to him Racha, or You Fool, much less is it lawful to keep in the memory anything which might convert anger into hate. JEROME; It is not, if you have anything against your brother, but, If your brother has anything against you, that the necessity of reconciliation may be more imperative. AUG. And he has somewhat against us when we have wronged him; and we have somewhat against him when he has wronged us, in which case there were no need to go to be reconciled to him, seeing we had only to forgive him, as we desire the Lord to forgive us. PSEUDO-CHRYS But if it is he that has done you the wrong, and yet you be the first to seek reconciliation, you shall have a great reward. CHRYS. If love alone is not enough to induce us to be reconciled to our neighbor, the desire that our work should not remain imperfect, and especially in the holy place, should induce us. GREG. Lo, He is not willing to accept sacrifice at the hands of those who are at variance. Hence then consider how great an evil is strife, which throws away what should be the means of remission of sin. PSEUDO-CHRYS See the mercy of God, that He thinks rather of man's benefit than of His own honor; He loves concord in the faithful more than offerings at His altar; for so long as there are dissensions among the faithful, their gift is not looked upon, their prayer is not heard. For no one can be a true friend at the same time to two who are enemies to each other. In like manner, we do not keep our fealty to God, if we do not love His friends and hate His enemies. But such as was the offense, such should also be the reconciliation. If you have offended in thought, be reconciled in thought; if in words, be reconciled in words; if in deeds, in deeds be reconciled. For so it is in every sin, in whatsoever kind it was committed, in that kind is the penance done. HILARY; He bids us when peace with our fellow men is restored, then to return to peace with God, passing from the love of men to the love of God; then go and offer your gift. AUG. If this direction be taken literally, it might lead some to suppose that this ought indeed to be so done if our brother is present, for that no long time can be meant when we are bid to leave our offering there before the altar. For if he be absent, or possibly beyond sea, it is absurd to suppose that the offering must be left before the altar, to be offered after we have gone over land and sea to seek him. Wherefore we must embrace an inward, spiritual sense of the whole, if we would understand it without involving any absurdity. The gift which we offer to God, whether learning, or speech, or whatever it be, cannot be accepted of God unless it be supported by faith. If then we have in anything harmed a brother, we must go and be reconciled with him, not with the bodily feet, but in thoughts of the heart, when in humble contrition you may cast yourself at your brother's feet in sight of Him whose offering you are about to offer. For thus in the same manner as though He were present, you may with unfeigned heart seek His Forgiveness; and returning thence, that is, bringing back again your thoughts to what you had first begun to do, may make your offering. 25. Agree with your adversary quickly, while you are in the way with him; lest at any time the adversary deliver you to the judge, and the judge deliver you to the officer, and you be cast into prison. 26. Verily I say to you, you shall by no means come out thence, till you have paid the uttermost farthing. HILARY; The Lord suffers us at no time to be wanting in peaceableness of temper, and therefore bids us be reconciled to our adversary quickly, while on the road of life, lest we be cast into the season of death before peace be joined between us. AUG. Let us see who this adversary is to whom we are bid to be benevolent. It may then be either the Devil or man or the flesh or God or His commandments. But I do not see how we can be bid be benevolent or agreeing with the Devil; for where there is good will, there is friendship, and no one will say that friendship should be made with the Devil, or that it is well to agree with him, having once proclaimed war against him when we renounced him; nor ought we to consent with him, with whom had we never consented, we had never come into such circumstances. JEROME; Some, from that verse of Peter, Your adversary the Devil, &c. (1 Peter 5:8) will have the Savior's command to be, that we should be merciful to the Devil, not causing him to endure punishment for our sakes. For as he puts in our way the incentives to vice, if we yield to his suggestions, he will be tormented for our sakes. Some follow a more forced interpretation, that in baptism we have each of us made a compact with the Devil by renouncing him. If we observe this compact, then we are agreeing with our adversary, and shall not be cast into prison. AUG. I do not see again how it can be understood of man. For how can man be said to deliver us to the Judge, when we know only Christ as the Judge, before whose tribunal all must be sisted. How then can he deliver to the Judge, who has himself to appear before Him? Moreover if any has sinned against any by killing him, he has no opportunity of agreeing with him in the way, that is in this life; and yet that hinders not but that he may be rescued from judgment by repentance Much less do I see how we can be bid be agreeing with the flesh; for they are sinners rather who agree with it; but they who it into subjection, do not agree with it, but compel it to agree with them. JEROME. And how can the body be cast into prison if it agree not with the spirit, seeing soul and body must go together, and that the flesh can do nothing but what the soul shall command? AUG. Perhaps then it is God with whom we are here enjoined to agree. He may be said too be our adversary, because we have departed from Him by sin, and He resists the proud. Whosoever then shall not have been reconciled in this life with God through the death of His Son, shall be by Him delivered to the Judge, that is, the Son, to whom He has committed all judgment. And man may be said to be in the way with God, because He is everywhere. But if we like not to say that the wicked are with God, who is everywhere present, as we do not say that the blind are with that light which is everywhere around them, there only remains the law of God which we can understand by our adversary. For this law is an adversary to such as love to sin, and is given us for this life that it may be with us in the way. To this we ought to agree quickly, by reaching, hearing, and bestowing on it the summit of authority, and that when we understand it, we hate it not because it opposes our sins, but rather love it because it corrects them; and when it is obscure, pray that we may understand it. JEROME; But from the context the sense is manifest; the Lord is exhorting us to peace and concord with our neighbor; as it was said above, Go, be reconciled to your brother. PSEUDO-CHRYS.The Lord is urgent with us to hasten to make friends with our enemies while we are yet in this life, knowing how dangerous for us that one of our enemies should die before peace is made with us. For if death bring us while yet at enmity to the Judge, he will deliver us to Christ, proving us guilty by His judgment. Our adversary also delivers us to the Judge, when he is the first to seek reconciliation; for he who first submits to his enemy, brings him in guilty before God. HILARY; Or, the adversary delivers you to the Judge, when the abiding of your wrath towards him convicts you. AUG. By the Judge I understand Christ, for the Father has committed all judgment to the Son; and by the officer or minister, an Angel, for, Angels came and ministered to Him; and we believe that He will come with His Angels to judge. PSEUDO-CHRYS. The officer, that is, the ministering Angel of punishment, and he shall cast you into the prison of hell. AUG. By the prison I understand the punishment of the darkness. And that none should despise that punishment, He adds, Verily I say to you, you shall not come out thence till you have paid the very last farthing. AUG. Or it is an expression to denote that there is nothing that shall go unpunished; as we say 'To the dregs,' when we are speaking of anything so emptied that nothing is left in it. Or by the last farthing may be denoted earthly sins. For the fourth and last element of this world is earth. Paid, that is in eternal punishment; and until used in the same sense as in that, Sit on my right hand until I make your enemies your footstool; for He does not cease to reign when His enemies are put under His feet. So here, until you have paid, is as much as to say, you shall never come out thence, for that he is always paying the very last farthing while he is enduring the everlasting punishment of earthly sins. PSEUDO-CHRYS Or, if you will make your peace yet in this world, you may receive pardon of even the heaviest offenses; but if once damned and cast into the prison of hell, punishment will be exacted of you not for grievous sins only, but for each idle word, which may be denoted by the very last farthing. HILARY; For because charity covers a multitude of sins, we shall therefore pay the last farthing of punishment, unless by the expense of charity we redeem the fault of our sin. PSEUDO-CHRYS.Or, the prison is worldly misfortune which God often sends upon sinners. CHRYS. Or, He here speaks of the judges of this world, of the way which leads to this judgment, and of human prisons; thus not only employing future but present inducements, as those things which are before the eyes affect us most, as St. Paul also declares, If you do evil, fear the power, for He bears not the sword in vain. Spare us O Lord, spare us. We thank you, God our Father, for those who have responded to your call to priestly ministry. Accept this prayer we offer on their behalf: Fill your priests with the sure knowledge of your love. Open their hearts to the power and consolation of the Holy Spirit. Lead them to new depths of union with your Son. Increase in them profound faith in the Sacraments they celebrate as they nourish, strengthen and heal us. Lord Jesus Christ, grant that these, your priests, may inspire us to strive for holiness by the power of their example, as men of prayer who ponder your word and follow your will. O Mary, Mother of Christ and our mother, guard with your maternal care these chosen ones, so dear to the Heart of your Son. Intercede for our priests, that offering the Sacrifice of your Son, they may be conformed more each day to the image of your Son, our Lord and Savior, Jesus Christ. Amen. 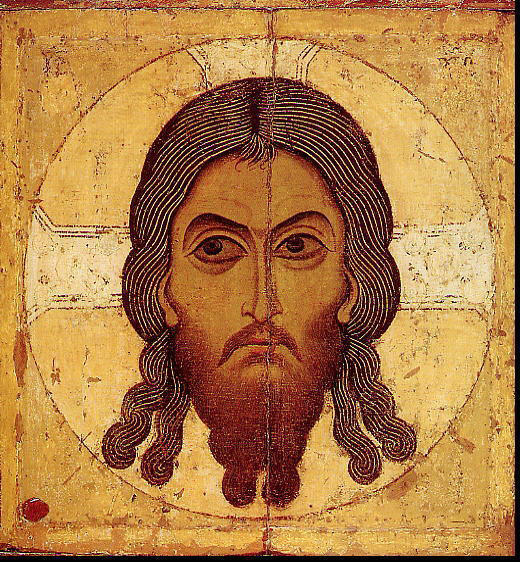 This icon shows Jesus Christ, our eternal high priest. The gold pelican over His heart represents self-sacrifice. The border contains an altar and grapevines, representing the Mass, and icons of Melchizedek and St. Jean-Baptiste Vianney. Melchizedek: king of righteousness (left icon) was priest and king of Jerusalem. He blessed Abraham and has been considered an ideal priest-king. St. Jean-Baptiste Vianney is the patron saint of parish priests. Pray a Rosary each day for our nation. 1. Sign of the Cross: In the name of the Father, and of the Son, and of the Holy Spirit. Amen. 2. The Apostles Creed: I BELIEVE in God, the Father almighty, Creator of heaven and earth, and in Jesus Christ, His only Son, our Lord, who was conceived by the Holy Spirit, born of the Virgin Mary, suffered under Pontius Pilate, was crucified, died, and was buried. He descended into hell; on the third day he rose again from the dead; he ascended into heaven, and is seated at the right hand of God, the Father Almighty; from there He shall come to judge the living and the dead. 3. The Lord's Prayer: OUR Father, who art in heaven, hallowed be Thy name. Thy kingdom come. Thy will be done on earth as it is in heaven. Give us this day our daily bread and forgive us our trespasses as we forgive those who trespass against us. And lead us not into temptation, but deliver us from evil. Amen. 5. Glory Be: GLORY be to the Father, and to the Son, and to the Holy Spirit. As it was in the beginning, is now, and ever shall be, world without end. Amen. 6. Fatima Prayer: Oh, my Jesus, forgive us our sins, save us from the fires of hell, lead all souls to heaven, especially those in most need of your mercy. Announce each mystery, then say 1 Our Father, 10 Hail Marys, 1 Glory Be and 1 Fatima prayer. Repeat the process with each mystery. Hail, Holy Queen, Mother of Mercy, our life, our sweetness and our hope! To thee do we cry, poor banished children of Eve! To thee do we send up our sighs, mourning and weeping in this vale of tears! Turn then, most gracious advocate, thine eyes of mercy towards us; and after this, our exile, show unto us the blessed fruit of thy womb, Jesus! O clement, O loving, O sweet Virgin Mary! Pray for us, O holy Mother of God, that we may be made worthy of the promises of Christ. 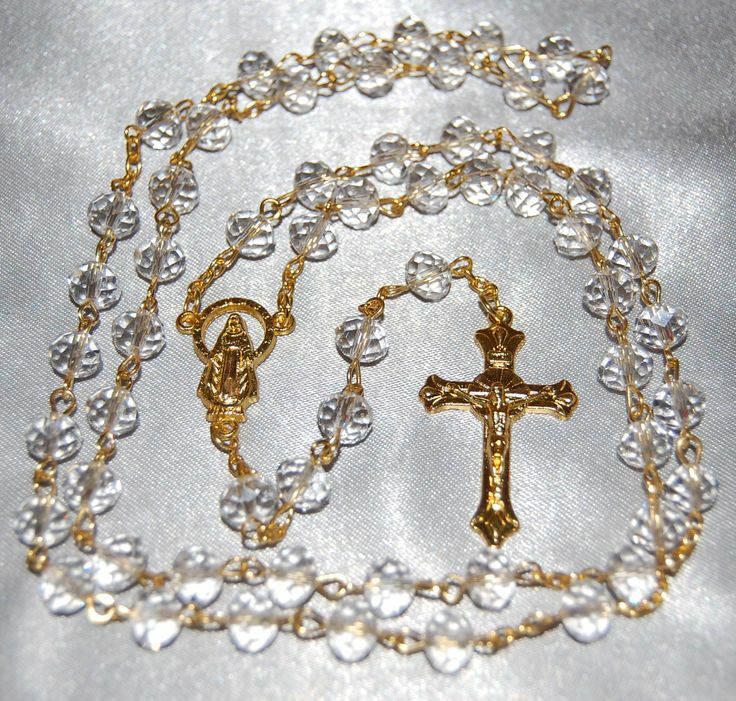 The Mysteries of the Rosary By tradition, Catholics meditate on these Mysteries during prayers of the Rosary. The biblical references follow each of the Mysteries below. 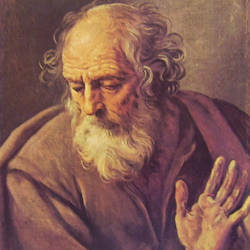 Glorious Saint Joseph, pattern of all who are devoted to toil, obtain for me the grace to toil in the spirit of penance, in order thereby to atone for my many sins; to toil conscientiously, putting devotion to duty before my own inclinations; to labor with thankfulness and joy, deeming it an honor to employ and to develop, by my labor, the gifts I have received from Almighty God; to work with order, peace, moderation, and patience, without ever shrinking from weariness and difficulties; to work above all with a pure intention and with detachment from self, having always before my eyes the hour of death and the accounting which I must then render of time ill-spent, of talents unemployed, of good undone, and of my empty pride in success, which is so fatal to the work of God. All for Jesus, all through Mary, all in imitation of thee, 0 Patriarch Joseph! This shall be my motto in life and in death. Amen. O Joseph, virgin-father of Jesus, most pure spouse of the Virgin Mary, pray every day for us to the same Jesus, the Son of God, that we, being defended by the power of His grace and striving dutifully in life, may be crowned by Him at the hour of death. Patron: Against doubt; against hesitation; Americas; Austria; Diocese of Baton Rouge, Louisiana; California; Belgium; Bohemia; bursars; cabinetmakers; Canada; Carinthia; carpenters; China; Church; confectioners; craftsmen; Croatian people (in 1687 by decree of the Croatian parliament) dying people; emigrants; engineers; expectant mothers; families; fathers; Florence, Italy; happy death; holy death; house hunters; immigrants; interior souls; Korea; laborers; Diocese of La Crosse, Wisconsin; Archdiocese of Louisville, Kentucky; Diocese of Manchester, New Hampshire; Mexico; Diocese of Nashville, Tennessee; New France; New World; Oblates of Saint Joseph; people in doubt; people who fight Communism; Peru; pioneers; pregnant women; protection of the Church; Diocese of San Jose, California; diocese of Sioux Falls, South Dakota; social justice; Styria, Austria; travelers; Turin Italy; Tyrol Austria; unborn children Universal Church; Vatican II; Viet Nam; Diocese of Wheeling-Charleston West Virginia; wheelwrights; workers; working people. Symbols: Bible; branch; capenter's square; carpenter's tools; chalice; cross; hand tools; infant Jesus; ladder; lamb; lily; monstrance; old man holding a lily and a carpenter's tool such as a square; old man holding the infant Jesus; plane; rod. Pope Pius X composed this prayer to St. Joseph, patron of working people, that expresses concisely the Christian attitude toward labor. It summarizes also for us the lessons of the Holy Family's work at Nazareth. Glorious St. Joseph, model of all who devote their lives to labor, obtain for me the grace to work in the spirit of penance in order thereby to atone for my many sins; to work conscientiously, setting devotion to duty in preference to my own whims; to work with thankfulness and joy, deeming it an honor to employ and to develop by my labor the gifts I have received from God; to work with order, peace, moderation, and patience, without ever shrinking from weariness and difficulties; to work above all with a pure intention and with detachment from self, having always before my eyes the hour of death and the accounting which I must then render of time ill spent, of talents wasted, of good omitted, and of vain complacency in success, which is so fatal to the work of God. All for Jesus, all through Mary, all in imitation of you, O Patriarch Joseph! This shall be my motto in life and in death, Amen. Holy Joseph, pray for us. Faithful Protector of Christ, pray for us. Joseph most courageous, pray for us. Model of working men, pray for us. Ornament of the domestic life, pray for us. Pillar of the family, pray for us. Consoler of the miserable, pray for us. V. He hath made him master of His house. O God, who in Thy ineffable providence didst vouchsafe to choose blessed Joseph to be the Spouse of Thy most holy Mother: grant, we beseech Thee, that we may have him for our intercessor in Heaven, whom on earth we venerate as out most holy Protector. Who livest and reignest world without end. Amen. Was St. Joseph a tzadik? O Saint Joseph, I never weary contemplating you and Jesus asleep in your arms; I dare not approach while He reposes near your heart. Press Him in my name and kiss His fine head for me, and ask Him to return the Kiss when I draw my dying breath, Amen. Recognition of the Right of Christian Communities: That Christian communities, especially those who are persecuted, feel that they are close to Christ and have their rights respected.